This necklace looks fabulous in any setting, with multi-coloured pearls on different strings twisted together to make a magical product. 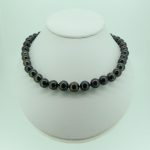 Whether worn for daytime with a crisp linen sundress or for evening against a formal gown, this necklace looks completely at home. 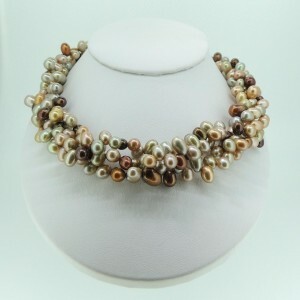 Consisting of freshwater rice (oval) pearls between 5 and 5.5 mm strung on silk with a rhodium plated jumbo spring ring clasp, this necklace is light and easy to wear and matches all skin tones. 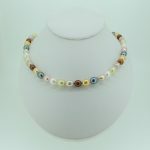 Because of the multicoloured strands and the loose twist, this necklace has lots of movement and will attract a lot of attention.